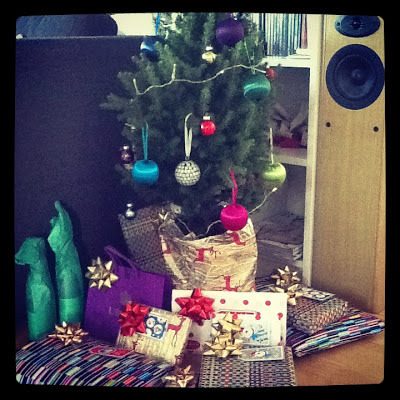 First there were the mince pies, then there was Bing Crosby blaring from our speakers ... in November. Sure, it's only December 4th, but at our place? It's Christmas. 2. 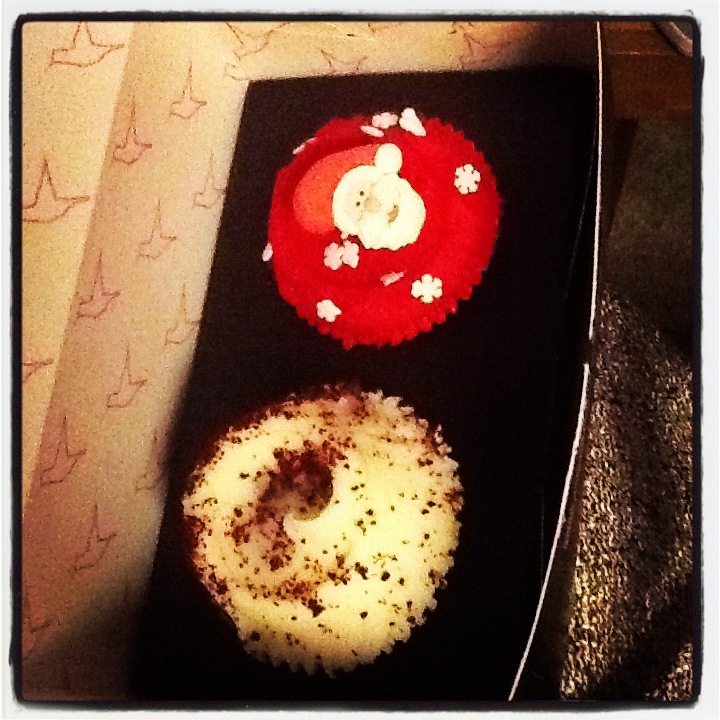 Hummingbird Bakery's Christmas-themed cupcakes. Sure, I woke up to these by my bedside on my birthday, but as Ruth said on my birthday (or the e-card she sent me said), "If you were Jesus, today would be Christmas." So, really, my birthday was as good as Christmas. That's red velvet at the bottom with cream cheese frosting (my favorite) and vanilla at the top, with a marzipan Santa and buttercream frosting (also my favorite. Hmm.). Seasonal treats are definitely a sign that Christmas is nigh. 3. Wrapped presents sitting under the tree, which in our case, resembles a potted plant - but hey, you can hang ornaments off of it, so it's a tree (it also cost £12 from Budgens). John and I had a huge wrapping session/party with toffee popcorn on Saturday, which was fun, but also involved me biting my tongue while watching him wrap presents incorrectly (like, wrapping and taping along the long edge of the gift, massacring the edges while slicing through the paper with a butter knife and/or not cutting straight lines), though I must admit, his turned out stunningly well as it turns out his methods are especially useful for wrapping soft items. No hints given away there! So yes. Put an egg-nog latte in my hand and I'm good to go. Christmas, I welcome you with open arms.